Sticking to a diet can be tough, very tough. For anybody that has done a diet in the past knows, it takes motivation, patience, consistency and a lot of self-control. 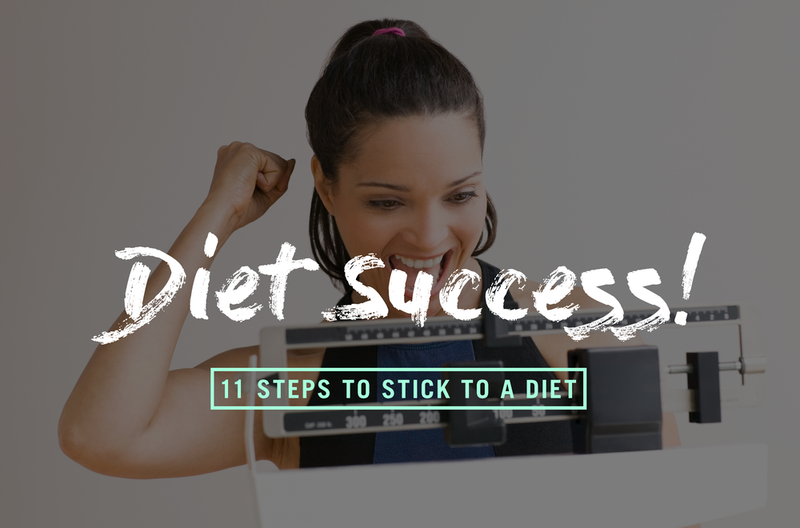 Thankfully however, there are some important steps, 11 to be precise that can help you stick to a diet and successfully lose weight. As I ask all of my new clients, what is your goal? Whether it’s to lose a couple of pounds of stubborn belly fat or to lose 50lbs in one year, it’s important to first establish exactly what you’d like to achieve. Then and only then can you take the necessary steps to tailor-make a diet that works best for you! Note: It's important to set a realistic goal in an attainable time frame. There’s no good setting your target on losing ten kilos a month. Not only is it near impossible to do, you may die trying. The recommended healthy amount of weight loss is from 1-2 pounds a week. Not only will a well-planned diet offer structure and accountability, by taking the time to analyse your needs, lifestyle and goals before committing to any given diet, you remove all of the guesswork from the equation which allows you a far greater chance of sticking with it. Be realistic when choosing a diet. If you choose one that includes mainly foods that you don’t enjoy or a diet that isn’t compatible with your lifestyle, you’re setting yourself up for failure from the get-go. If you hate salads, don’t eat them. Instead, choose healthy versions of the foods you do enjoy. Example: if you can’t live without burgers, don’t try to but instead, make a healthier version by using lean meat, cooked on a grill served on a wholegrain bun without all the condiments. Now that you have your diet plan, it’s time to stock your fridge with everything you need. By having easy access to a selection of the healthy and fresh foods that are included in your diet, you’re far less likely to deviate from your diet plan. Such a simple yet effective way to avoid food cravings and cheating on your diet. Before starting your weight loss journey, get rid of all the junk food in your fridge, freezer and cupboards. By removing all of the easily accessible temptations from your kitchen, they're out of sight and out of mind (Hopefully). Tedious as hell but very important when dieting. Take a few hours at the weekend to cook as much food as possible for the week ahead. By having ready to eat food at your disposal, you’re far less likely to make excuses not to eat healthy at lunchtime and when returning home after a long day at work. Proven to be extremely effective at curbing cravings. Make sure to allow for a cheat meal 1-2 times per week. Not only should it re-motivate you to return to your diet following your meal of choice, it can actually rev-up your metabolism. Note: A cheat meal is 1 meal, not a day of eating whatever you like! Once you’re done with your cheat meal, get right back on track. Write a list of reasons for wanting to lose weight and take a quick look at them during any moments of doubt or potential weakness. By having a little reminder of why you’ve chosen to diet in the first place, you’re much more likely to choose an apple over apple pie when hungry or cravings strike. “What?” I hear you saying. “But that goes against everything I’ve ever read about weight loss!” Hear me out. While some diets do recommend you eat your final meal or no carbs after 5 pm, from my experience, it’s not realistic or sustainable. If you eat your final meal of the day at let's say 6 pm, that leaves at least 5 hours until bedtime. Quite a long time without food wouldn’t you say? Especially when the sofa and Netflix are involved. The truth is if you’re anything like me, cravings for sweet food and treats come at night, not in the morning, not at lunch and not before dinner. By eating dinner closer to bedtime, there’s less time to give in to sugary cravings before bed. While it’s not the most social thing to do, try to eat the good majority of your meals at home. If you’re concerned about your social life, invite friends to yours and cook something healthy. If you do dine out, don’t be afraid to ask the waiter for some special requirements. Believe me, they’ll have heard them all before and the majority of good restaurants should accommodate most if not all of your dietary requests. While skipping a meal here and there won’t do you any harm, it’ll do little for your energy, mood or your metabolism if you regularly go hungry. If you know you’re going to be eating late or taking a lot of time between meals, make sure to plan a couple of small and healthy snacks to keep hunger at bay until your next meal. While you can effectively lose weight without exercise, it makes it so much easier to do when you combine the two! Not only can you burn over 500 calories per hour of exercise, you’ll fire up your metabolism allowing you to burn more calories when resting. It's win-win.